You are the peacemakers in the world. You are the leaders, the organizers, the conscious creators whose vision and actions are helping to evolve our planet. Have you seen our UNIFY Global Map lately? 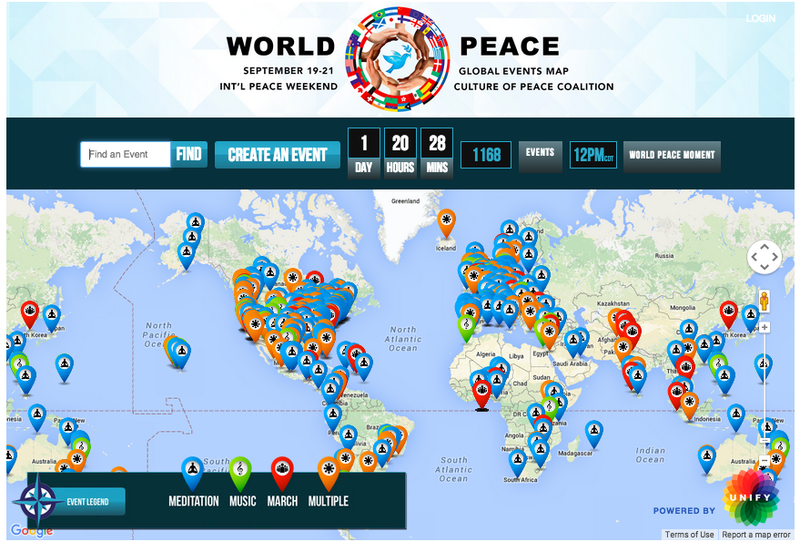 At last count, there were nearly 1,168 Peace Weekend events posted, spanning all across the globe. Every icon on the map representing an Organizer, like you, who answered the call to be a leader for peace in their community. Join or organize a Global Dance Party for Peace! We are partnering with Silent Disco Squad to bring the transformational power of music and dance into everyday moments through massive public dance parties. Celebrate Peace with a LIFE Party! Xanopia LIFE Party’s are gatherings of conscious individuals who want to celebrate in an uplifting (and alcohol-free) atmosphere. Practice yoga. Create a peace themed yoga flow, or host a sunrise yoga ceremony for yourself, your friends, or your community this weekend. Include extra heart-openers (Camel and bridge pose, anyone?) to get your heart ready for peace weekend. Invite friends to a forgiveness letter writing party. Inner peace and forgiveness go hand in hand. Write forgiveness and gratitude to letters to people in your community. Volunteer in the name of peace. Serve a meal at the local soup kitchen, or organize a neighborhood clean up at the local park and add a meditation at the end. Thank you for all your heart work, peace maker. Ps. Have you seen our new 2015 Peace video? Check it out and share with your friends. Peace Weekend 2015 is arriving with each moment and we are so honored to be celebrating it with you. As the weekend rises above the horizon, we want to shine the light on all the peace and meditation activities that will be happening around the world this weekend. Each day offers you and the global community new ways to connect in peace and reflection. On Saturday, September 19th at 5pm PST, 11pm GMT: Join the whole world in a single shared moment of intention during our Global Synchronized Meditation. 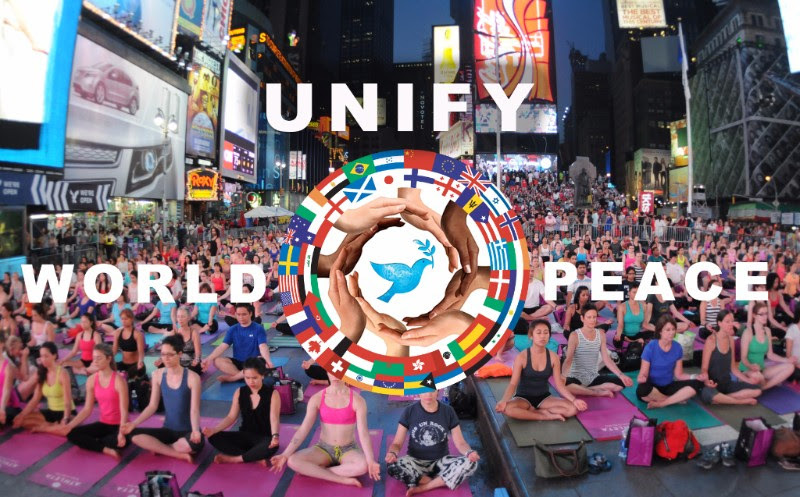 Celebrations start at 4pm PST/10pm GMT with the world premiere of the film “Inner Peace to World Peace,” and the Global Synchronized Meditation Broadcast will start after. On Sunday, September 20th, at 12pm noon local time: Join in the World Peace Wave. At 12 noon, in your own time zone, a Peace Wave will be expanding across the globe- flowing from one time zone to the next. Feel the expansiveness as meditation and peace celebrations encircle our planet. On Monday, September 21st: The International Day of Peace is here. Take peace into your workplace- help your whole office do a “digitial detox” at noon in your office; get everyone to turn off their phones, turn away from their computers, and turn inwards, even if just for a minute of shared reflection. 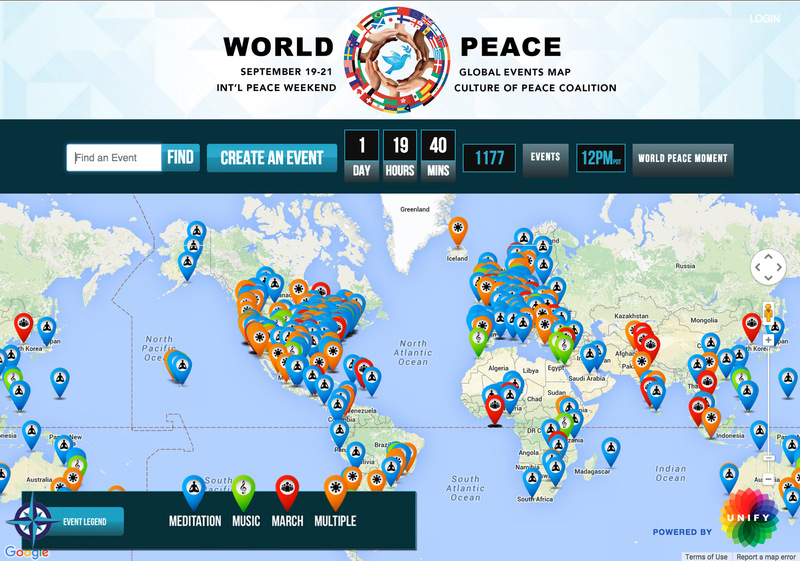 Right now, there are 1177 events registered on our UNIFY Global Peace Map. Click here to find or create a Peace Weekend Event in your city. Ps. Have you seen our new 2015 Peace video? Check it out and share with your friends. Click the following image. World Peace Weekend is almost here! This email is full of all the information you will need for the weekend. Join tens of thousands of people from all corners of the world for a spectacular global meditation experience via live teleconference! We will unite with Earthdance events worldwide for the Earthdance Prayer of Peace. We will hear messages of Peace from representatives of The World Peace Prayer Society meditation circles on 6 different continents. Internationally renowned mystic Thomas Hübl from Germany will lead us in a profound global peace meditation. And we will dance together to celebrate Peace! Last year’s call involved almost 3,000 live participants, let’s make this year’s call even bigger! We invite you all to visualize the wave of peace traveling around the world, every hour in a different region. It’s beautiful to think of wrapping the earth with love in this way! Be creative! And share with us what you do! Please photograph all your events and share pictures on our Facebook Page! Keep inviting friends to the main event. Be the peace you wish to see in the world throughout it all. Blessings of peace to you and this beautiful planet!